This topic contains 14 replies, has 3 voices, and was last updated by Hillel Coren 3 weeks, 6 days ago. after playing around with InvoiceNinja for a while I found some things I have questions about. I found out that invoice numbers are created / assigned at the moment when a new invoice is saved as draft. Sometimes I create drafts (more than one), add some items within one or two weeks and then I finish the invoice. Is it possible to only assign an invoice number when the invoice is saved “finally”. Otherwise the order of invoices will not be correct or I have to manually check. Is it possible to add an item from time tracking when I have already started creating the invoice either with products or with time tracking items? 3. Adding an Item to an invoice with items from time tracking adds a new separated items table. This seems to be a separation between services and products. As I mostly sell services and not products I would like to have them all in one place. Anyway it looks weird to me having two separated tables in one invoice. Is it possible to put everything into one table? 4. I just read in the docs that I can only send recurring invoices automatically to clients with stripe enabled? Is that correct? If yes: Why? I do not need online payment at all at the moment. 5. I have set InvoiceNinja to use the comma “,” as decimal. Anyway I cannot enter numbers with a comma but must use the decimal point “.” when entering numbers. Can I change this anywhere? 2. If you assign the task to a client you can click ‘More action’ on the edit task page to add it to an invoice. 3. You’d need to add the products to the tasks section of the invoice. 4. That isn’t correct, where did you read it? thanks once again for your reply! Very helpful. #1 would be the most important feature for me. But anyway I can also pay more attention to invoice numbers when creating them. 2) Can I also modify the existing default templates (Clean, Photo…) and use them as custom templates? Can they be renamed? If not: Can I delete them or hide them from the selection in the document creation pages? 3) Would that be update-safe or will the templates be overwritten with upcoming updates? 4) Can I have more than three custom templates? The designs are stored in storage/templates, running php artisan db:seed --class=UpdateSeeder reads the designs from the files and loads them into the database. If you make changes you’d also need to clear the cache by adding ?clear_cache=true to the URL. I had the same problem too and I had a solution I create a quote BUT first go into Invoice Settings > Quote, and uncheck “Share invoice counter.” then I just create a new quote with all the service I give for the current months and at the end of the mont when I’m ready to send the invoice I convert the Quote to an invoice and this way the invoice numbers are keep ordered. But having a draft mode for invoice that don’t use/ignore invoice number would be lot more intuitive and straightforward IMO. 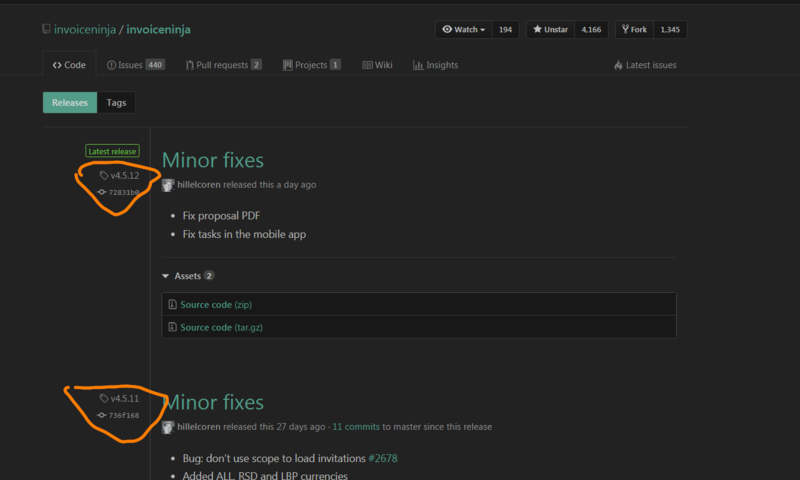 I’m confused since right now on Github we have the version v4.5.12 ???? This reply was modified 3 weeks, 6 days ago by Mikhoul. Ahhhh ! When the release of V2 is scheduled ?